Via delle Bocchette in the Dolomites of Brenta is the most famous, classical, and old via ferrata trek, from hut to hut in the Dolomites. 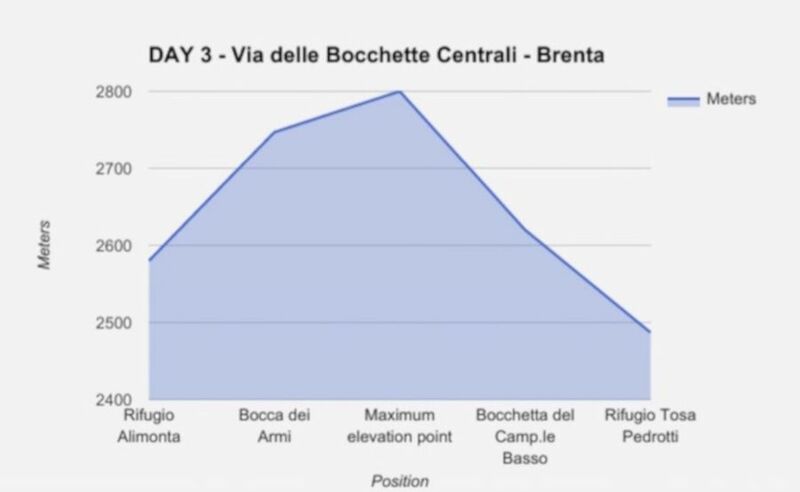 On fact, Via delle Bocchette is a concatenation of different via ferrata that we can set at your preferred number of days of tour, from 3 to 5 days we can customise your tour at best. In this page you find the complete trekking of 5 days of the ferratas Via delle Bocchette. This project was born in the 1932 with the “via delle Bocchette Centrali” (DAY 3) the most popular section of this long tour. Then during the years was enlarged until today that is possible to cross along the complete crest of peaks of the Brenta Dolomites. 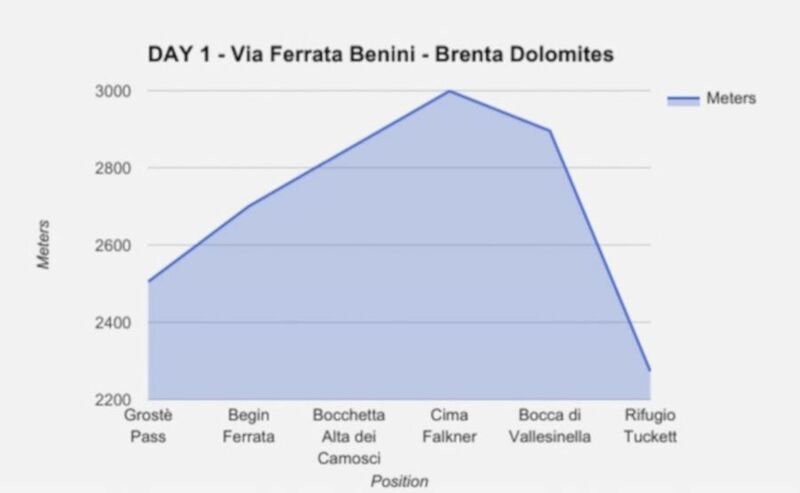 Total time of this day: 5.30 hrs – Total vertical gain (up): 600 m.
The first day we start early from Bolzano and go to the town of Madonna di Campiglio. Here we take the Grostè cableway and arrive in high quote in the north area of the Brenta Dolomites where start the first via ferrata of this tour: the “Via Ferrata Sentiero Benini”. This via ferrata is not particulary difficult, for this reason I prefer begin alway this tour from north in direction south. It’s a “overture” of the great panoramas of the next days! We arrive at Rifugio Tuckett, a historical mountain hut of the Italian Alpine Club, where we overnight. 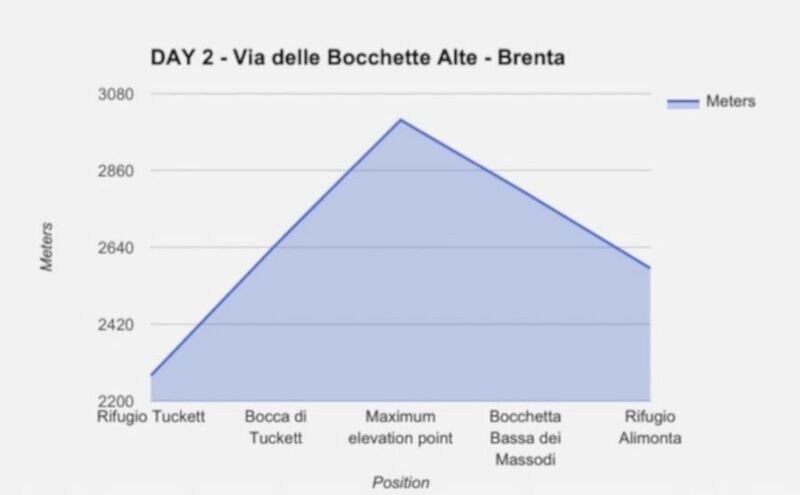 Total time of this day: 7.30 hrs – Total vertical gain (up): 900 m.
The second day we have the approach on the glacier of the Bocca di Tuckett (the Tuckett pass). In this short and steep glacier are generally necessary the crapons. From the pass Tuckett start the “Via Ferrata delle Bocchette Alte”. This via ferrata is long and in some sections a bit complicate, with many climbing up and down on long iron stairs, but is not exposed. We walk and climb for about 7-8 hours and arrive at the modern Rifugio Alimonta where we overnight. In case of bad weather we can climb in 3 hours the variant on the “Via Ferrata SOSAT”. 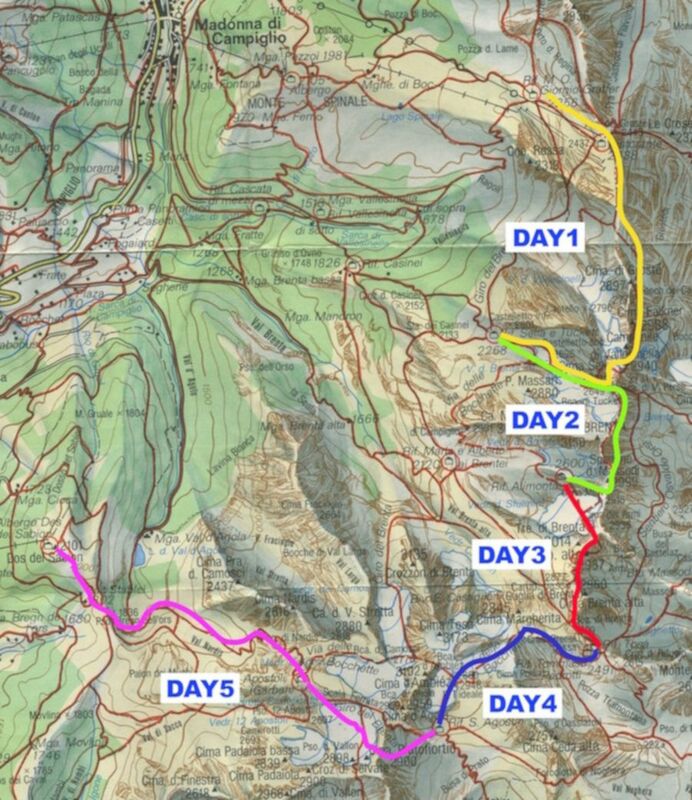 Total time of this day: 4.30 hrs – Total vertical gain (up): 600 m.
The third day is the best! From the Rifugio Alimonta we have a short approach on the little glacier and then begin the “Via delle Bocchette Centrali”. This via ferrata is the oldest and classical section of this long tour. Great panoramas, incredible exposition on the big walls, and easy climbing are the particular aspects of this via ferrata! We arrive at Rifugio Tosa Pedrotti, mountain hut of the Italian Alpine Club, where we overnight. 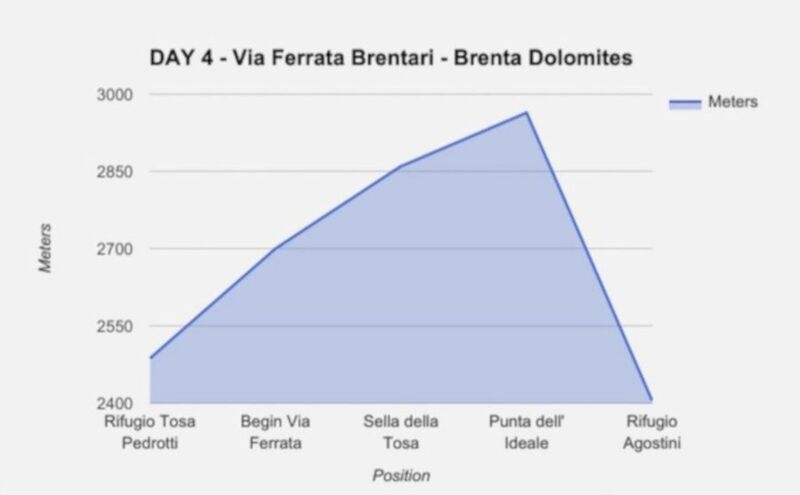 Total time of this day: 5.30 hrs – Total vertical gain (up): 500 m.
The day 4 continue with a other interessant via ferrata, the “Via Ferrata Brentari”. Now we will enter in the south part of the Dolomites of Brenta where the glaciers presence is more massive. This via ferrata is easy, but in approach as in downhill we walk at some glaciers. The ambient is continue changing with great and impressive peaks. We walk and climb for about 4 hours and arrive at the placed in the sunny east side of this group of mountains, where we overnight at Rifugio Agostini. 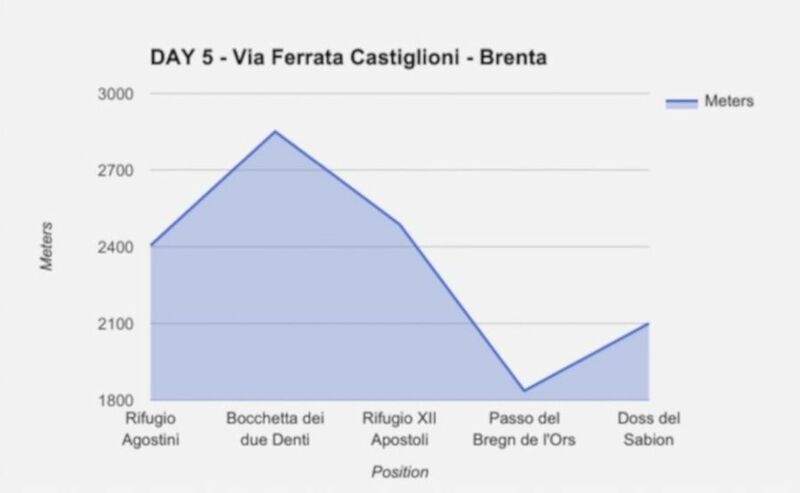 Total time of this day: 5.10 hrs – Total vertical gain (up): 700 m.
The last day we finish our long trek with a exposed via ferrata, the “Via Ferrata Castiglioni”. A long sequence of exposed iron ladders climb this wall to have the access at the terminal area of the Brenta Dolomites. This via ferrata is a perfect end of our great experience on the rock of the western Dolomites! After the via ferrata, we go downhill in direction of Rifugio XII Apostoli and to the Pinzolo cableway. We arrive with the gondola lift to the town of Pinzolo where you sit in a coffe to rest and I take the local bus to Madonna di Campiglio and to the car parking. 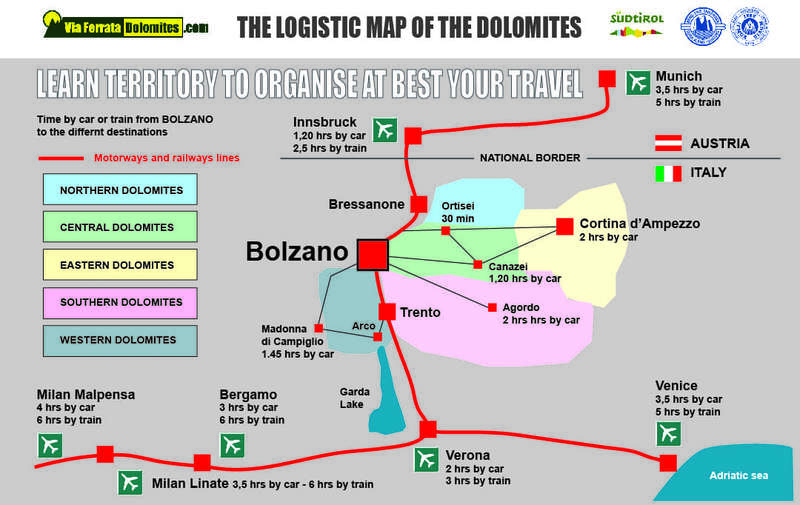 After 1-2 hours I come back with my car and we drive back to Bolzano at your hotel.